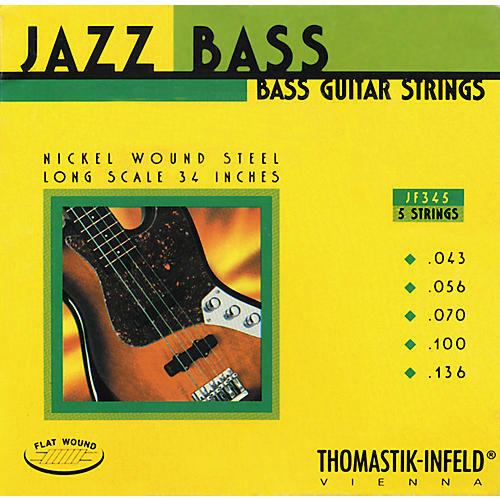 Nickel flatwound roundcore Jazz Series bass strings from Thomastik-Infeld boast extended durability and high output fundamentals with smooth, warm, balanced tone. A highly flexible steel core gives these bass strings a balanced feeling and special character. The overall sound characteristics can be described as very close to the double bass. 5-string set with gauges: .043, .056, .070, .100, and .136. G”STRING: Gauge: .043 in. ; Tension: 37.03 lbs. D”STRING: Gauge: .056 in. ; Tension: 37.47 lbs. A”STRING: Gauge: .070 in. ; Tension: 31.30 lbs. E”STRING: Gauge: .100 in. ; Tension: 34.39 lbs. B”STRING: Gauge: .136 in. ; Tension: 34.83 lbs.